The DAS cluster components comprise of the DAS Webapp and a DAS Event Processor. These components are installed on the Ambari cluster to use with DAS. Optionally, you can install the DAS-DP App within the DataPlane environment. The DAS-DP App communicates with the DAS components within the cluster. 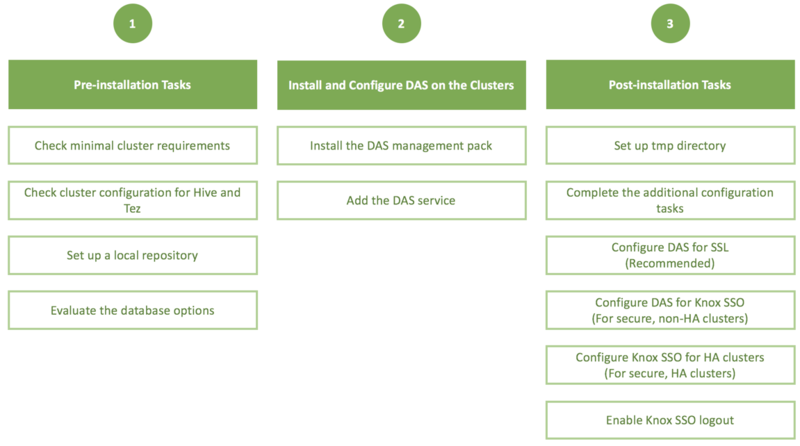 To install DAS/DAS-Lite, review the installation roadmap and follow the steps. We strongly encourage you to read the support requirements and the pre-installation tasks before you start the installation. 1 Check the minimal cluster requirements. To install and set up the necessary components and services, see Install the prerequisite components and services. 2 Check the cluster configuration for Hive and Tez. Check the configuration settings for Hive and Tez in Ambari. 3 Create and set up a local repository. Hortonworks does not host any public repository for DAS. Therefore, you need to setup a local repository to install the binaries. See Create and set up a local repository. 4 Evaluate the database options. DAS requires a PostgreSQL database for storing query event information. See Evaluate your database options. 5 Install the DAS management pack. Install DAS cluster components (the DAS Webapp and the DAS Event Processor) on the same machine on which you have installed the Ambari server, using an Ambari management pack (MPack). See Installing the DAS cluster components..
6 Add the DAS service. After installing the DAS MPack through the Ambari console, add the DAS service through the Ambari UI. See Adding the DAS Service through the Ambari UI. 7 Set up tmp directory. You need write permission on the /tmp directory to write logs for secure clusters. See Setting up the tmp directory. 8 Complete the additional configuration tasks. See Additional configuration tasks. 9 Configure DAS for SSL. It is recommended that you configure DAS for SSL. You can configure SSL if your HDP cluster is SSL-enabled. See (Recommended) Configuring DAS for SSL/TLS. 10 Configure DAS for Knox SSO. To enable DAS to work with the HDP cluster SSO, configure the Knox settings as described in Configuring DAS for Knox SSO. 11 Configure Knox SSO for HA clusters. To enable Knox SSO for HA clusters, see Configuring Knox SSO for HA clusters. 12 Enable Knox SSO logout. See Enabling logout option for secure clusters.